Marsha and I went out this evening to watch The Fantastiks performed by the Mid Ohio Valley Players (http://www.midohiovalleyplayers.org/). It was a fine performance and a lot of fun. I’m getting ready for an agility workshop tomorrow. I believe I’ll work both Kory and Prim. I think I suggested the other day that I’d be putting up some tunnel/contact discrimination drills. But I also want to do a Helter Skelter. This is tonic for being cooped up all winter. A nice wide open jumping drill will be just the ticket. There’s another long cruel month of winter to go. 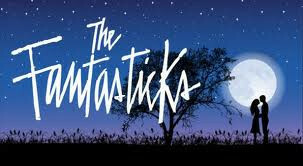 The Fantastiks had the seasons as a sub-plot, “Try to Remember”. These Eastern winters have always been tough on me. The world slowly and completely dies. And out of the depth of that negation the spring will arise. I’m anxious for it now. Okay, tomorrow I promise a return to dog agility. I’m really looking forward to working with my friends and students. Everybody will be ready for the new year. This is a continuation a discussion of how to create a course from a blank slate from my long ignored course design manuscript. The scribbled line method in yesterday’s web-log is a tried and true method. And, by the way, it was discussed in Stuart Mah’s Fundamentals of Course Design, published by Clean Run Productions nearly 20 years ago. Another approach I take to course design is to begin with a construct that I find particularly fascinating. You know in training with me that I spend a lot of energy in teaching the “Riddle of the Pinwheel”. Here’s a double pinwheel. I’m not going to make it a training exercise. The obvious thing to do would be to run through it like a figure-eight. Actually, I should be able to visit the elements of the double-pinwheel without requiring everyone to do it in any overt fashion. Next I’ll add a couple more jumps, to make “Hobday” boxes to join the two pinwheels. The box and the pinwheel are related constructions and I can play with the transitions between the two freely. I’ve also added a doodle drawing to frame the core challenge. Obviously I’ve got too much transitional distance in my “outside the box” loop. I can probably frame that with a tunnel or something. I also need to figure out where the front of my ring is going to be. And I have to pay a bit of attention to the number of obstacles. Again, I’m shooting for something from 18 to 20. Okay, I can introduce my core challenge with a simple serpentine down the side. The opening four jumps to the pipe tunnel present just enough challenge that the handler is likely going to be preoccupied with just getting started. So the course will be a great test of mental toughness. The handler must be able to respond to the course following the pipe tunnel. I borrowed one of the side jumps from the box framing the double pinwheels on the left. I could probably scoot those opening five obstacles more to the right… which would make the off-course opportunity following the third jump more pronounced. But I’m not a mean man, so I won’t. You can bet the dog will see the jump. The handler will have to convince the dog in the turn to jump #4. This came together rather easily. I added a dummy jump in the transition from jump #14 to jump #15. I also added a new jump and a pipe tunnel following jump #8. I could have done this with just a pipe tunnel. But frankly, I couldn’t get my obstacle count up to 18 without the extra jump. I rotated the #18 jump just a little bit. It’s an illusion that may cost a few dogs an off-course over jump #11 after jump #17. Just because the #18 jump is rotated 30º sure doesn’t mean that it’s a curling line. The closing, jump #15 to the end is pretty cruel, mindful that a dog tends curl back to the handler’s position when the handler is behind. The handler will have to either outrun his dog, or find another way to put pressure on the dog’s line on the final outrun. Okay, I really belabored the pinwheel without adequately exploring the variety of “core construct” possibilities. For example, this weekend I have a workshop here at my training center. 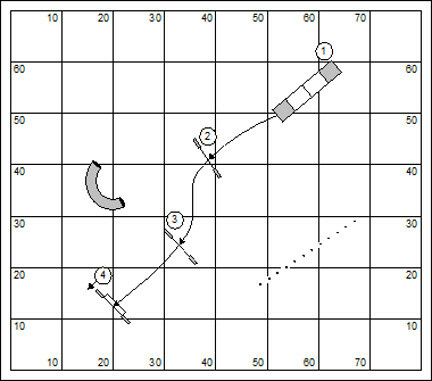 I want to do some work with tunnel/contact discriminations and I have a requirement to put up a progressive sending exercise (exploding line of jumps); and some interesting jumping serpentines. Those are “core constructs” which will dictate the design of the floor. Also in the course I created above I apparently intentionally included a “dummy” jump. Today I am completely opposed to sticking an otherwise unused obstacle out on the course just to give the dog and handler another opportunity to screw up. It’s a ham-handed design habit that shows little imagination. And unfortunately, the course doesn’t include all of the required obstacles. Eek! I continue publication of my course design notes from more than a dozen years ago. Perhaps this will tantalize another reader to critique the writing without actually bothering to read it. The design notes continue by focusing on different approaches to designing a course from tabula rasa to finished product. What I want to start with is a simple linear kind of progression. I have a line that goes straight up the center of the field. 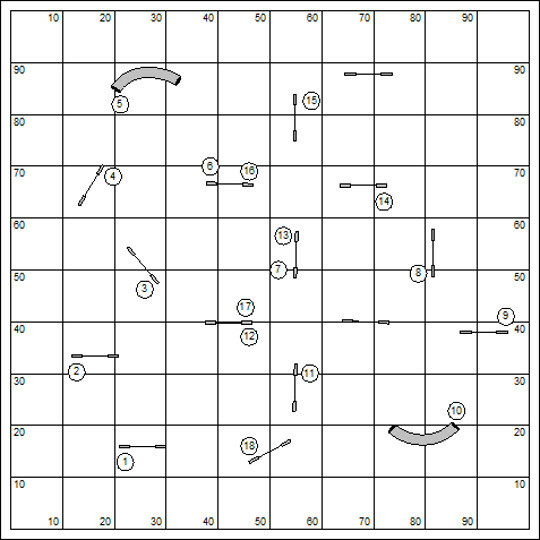 The course will square out to one side; then resume up the field, square out to the other side of the field, and return back downfield in the same fashion. I’ll start just by drawing a line. I’m intentionally making the lines and loops very square. This isn’t a requirement of the scribble a line method. It’s just my approach this very moment. The next task is to put in my technical obstacles for which I’ll need a judging position. This gives me an area to operate so that I don’t have to run up and down the field chasing a bunch of damned Border Collies to see if they get in the contact zones. From the looks of this placement, I’ll probably want to get the performance of the A‑frame first, and then back to the dogwalk. That would leave the teeter as the final technical obstacle to be judged. 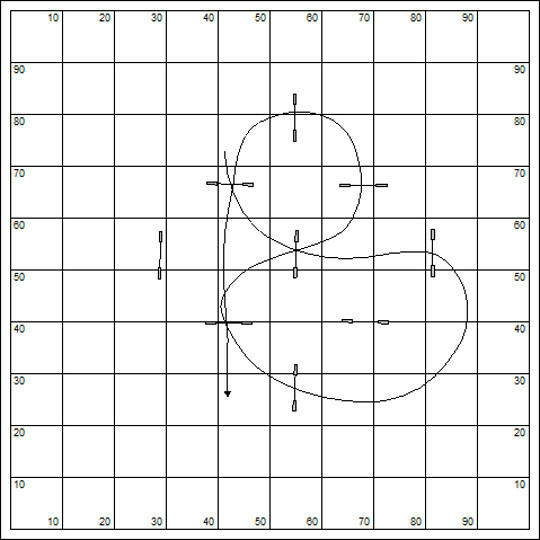 Okay, now I’m going to put some obstacles out to shape the dog’s path through the lines I’ve drawn, and to make transitions to the technical obstacles. Okay, not really too bad. But I really don’t like the transitional distance from the tire to the weave poles, or from the dogwalk to the jump following. I also only have 14 obstacles on the course. I need to pick it up to 18-20 and make sure I have the required obstacles. I need a table, and I need a collapsed chute. Okay, this is a bit more like it. The placement of the table actually gives me a bit of time to drift back down to judge the performance of the teeter. I’ve also rotated the obstacles in the first leg diverging from the center line so that a couple of traps or options are opened up to the dog. In the transition from jump #3 to the triple there will be some dogs who take a hard look at the weave poles. The handler would be wise to Vee the approach to jump #2 to take the weave poles out of the picture and make a nice smooth transition. In the turn from the tire to the weave poles jump #3 is presented as an off-course opportunity. The transition from the weave poles to jump #8 I figure is a major handling challenge. Many handlers may be caught with dog on right for the performance of the weave poles. So they may have to cross behind the dog on the exit from the weave poles to turn the dog to jump #8. Note that I’ve also rotated the jump between the A-frame and the dogwalk so that it is more fairly presented to the dog. Given that the dog is dismounting the A-frame and trying to get a safe approach to the dogwalk, I don’t think it’s a useful challenge to test of a handler knows how to make the transition “safe”. The series of jumps from the table to the teeter is really a finesse jumping series. It’s a flat serpentine-like sequence. But off-courses beckon at the A-frame after jump #13, and at jump #2 after jump #17. It’s not terrible hard, but is certainly a suitable challenge to Masters level dogs. Okay, all the course needs now is a start/finish line, field crew, and a bunch of exhibitors antsy to get a qualifying score. Will they see what was in my head when I designed it? Oh, that’s the least important thing in the world. Knowing your own capabilities and the strengths and weaknesses of your own dog are the keys to solving a course like this. What I like to believe about the course is that the challenges discovered themselves, with a modest bit of tweaking and rotation of jumps. I did my bit in making the approaches to the contact obstacles, the triple and the tire fair and safe. But I kept to my lines and the challenges sprouted like summer beans. And I really enjoy the subtlety of the challenges. Back to present time… I don’t know that I ever actually put up this course anywhere. Now I’m kind of interested and would like to give it a try. I have maybe one dog in my household who was alive when I wrote that piece. And don’t you know, when you look at a course you’ll always view it through a “me and my dog” filter. In those days I was running my old boys Bogie and Birdie. They’re long gone <sob>. But naturally, I visualize solving the course with my boy Kory. Frankly this course is a bunch easier than most of the stuff we’re seeing at the Masters/Excellent levels these days. Is that true? I continue my publication of notes on course design that I made something like a dozen years ago. Spread hurdles, contact obstacles, and arguably the tire should always be presented squarely to the dog, especially in the Novice and Starters classes to be fair, and safe. 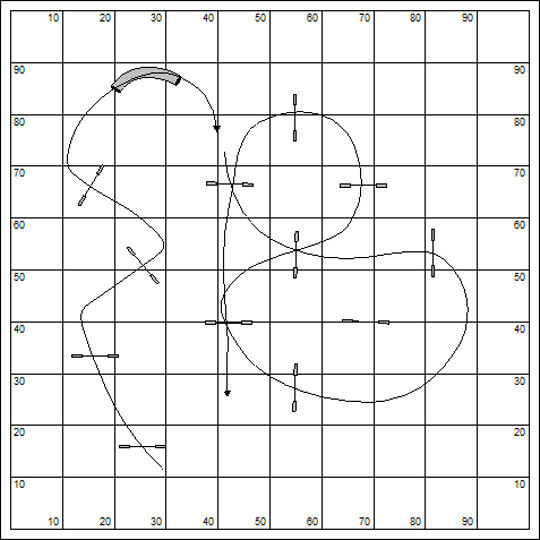 The course designer should always visualize the flow of the dog to present the contact obstacles and the spread hurdles safely and squarely. Don’t assume that handlers will have the skill or forethought necessary to correct the dog’s path to make an approach safe for the dog. 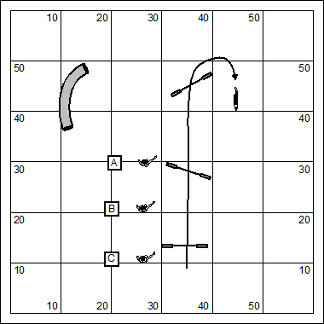 This is a segment of a course found recently at a NADAC trial. 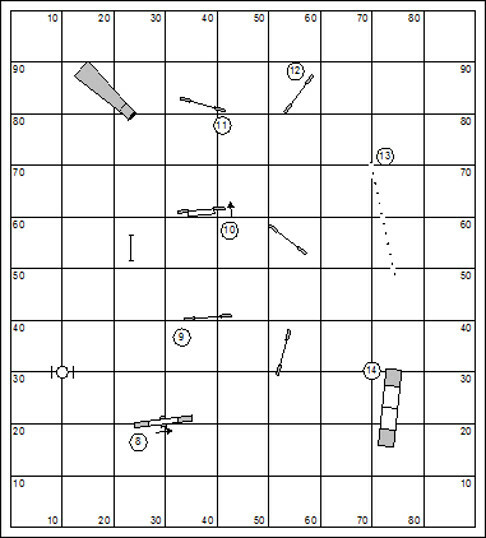 It was in the Open ring, and caused many dogs to NQ because the handlers did not have the requisite skill to jog the dog immediately to the right after the spread hurdle in order to create a straight approach to the A-frame. Most dogs were pushed directly by their handlers towards the A-frame. Something like 30% could not make the ascent, and came off the front end, some of them near the apex of the A-frame. Frankly, it’s the judge’s job to make a course safe for all dogs, no matter how experienced or inexperienced the handlers. This judge complained that the field was smaller she’d been told was available. So she just scrunched down her course until everything fit. She did not have the benefit of an experienced supervising judge to point out to her that she’d made an awful mistake. And so this was the result. For future reference, the judge is the ultimate authority on the field. An experienced judge would have demanded that the local crew actually move the ring rope so that the course would fit. If the dimensions of the ring are fixed (by hard walls) the judge would have to do an on the spot redesign to make everything safe, and fair. Designing a course on the field takes a lot of skill. All the judge really has to do is walk the course, once set, to see the approaches to all obstacles from the viewpoint of the dogs. The presentation of spread hurdles to the dog should is also an issue of fairness and safety. This illustration shows a presentation of the spread hurdle that requires a skillful manipulation of the dog’s path to create a safe approach. The course designer should not put dogs at risk when the handler does not have this skill manufacture a good approach to the spread hurdle. Don’t mistake this design for challenging. It is merely ugly. This is clearly advanced design, providing challenge at dogs’ speed, but inappropriate for novice dogs (because of the wrong course option). Squaring the dog’s approach for a spread hurdle really requires the course designer to understand the way dogs move. 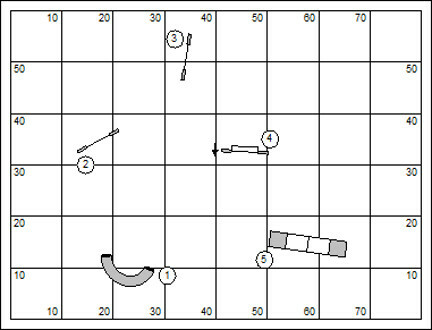 It is always a mistake, either as a handler or a course designer to be beguiled by the geometry of the course. This illustration shows the spread hurdle presented to the dog in a straight approach from jump #3. Square and fair, right? 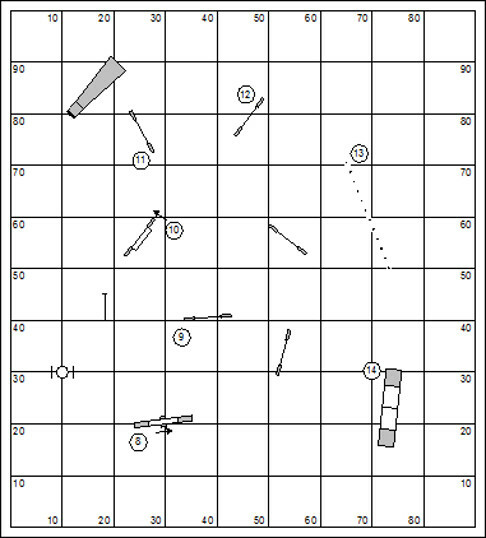 The problem with this line is that nothing on an agility course moves in lines like these excepting maybe the occasional judge’s measuring wheel. If you see a judge measuring a course like this, you can be certain of two things: 1) the standard course time (SCT) will be improperly set, and too low; 2) the judge has no vision of the way dogs move. While this was a bit of a dramatization, we see more subtle variations of the geometry problem all the time. Back to present time… I guess I got to poke fun of a NADAC judge who didn’t really know how to fit her course into an area smaller that it was intended to fit. 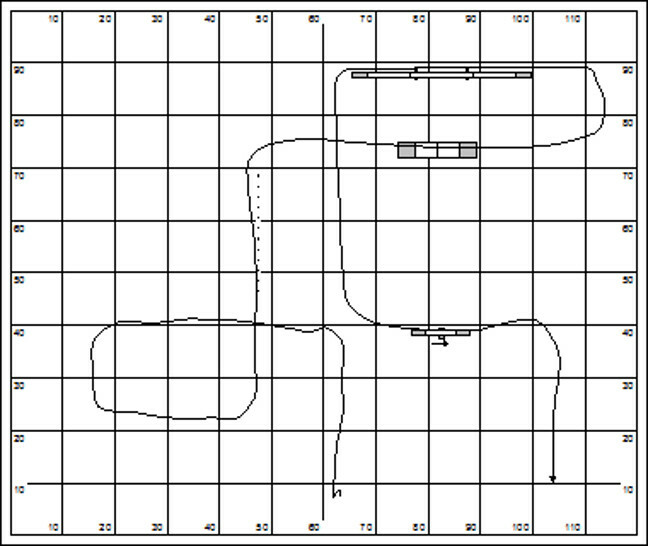 But you know, NADAC judges don’t design their own courses. 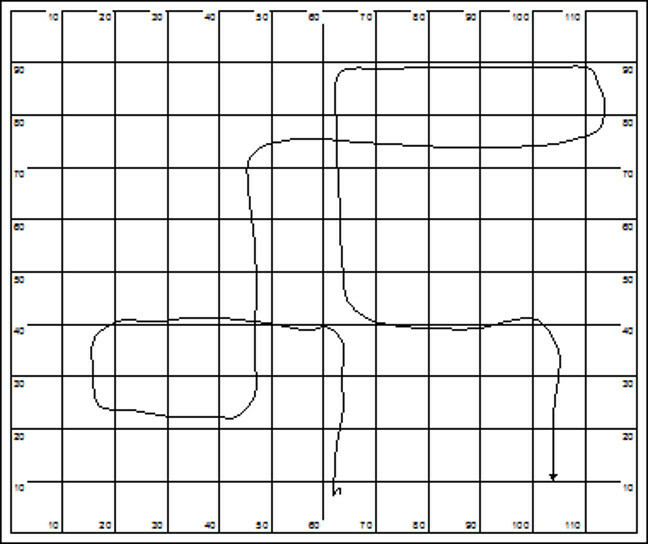 And so their course design skills are going to be a little retarded. It’s a straight line through jumps #2 to #4… right? It’s not a straight line at all. It’s a wild zig-zaggedy line. More than a dozen years ago I started a collection of writings on course design for dog agility (under the working title “The Border Collie Effect on Pipe Tunnels”) It never coalesced into a finish product. But now that I pick it up again this writing is surely amusing fodder for my long ignored web log. I’ve been working recently on designing courses for my own upcoming judging assignments and have been reviewing a ton of TDAA courses. Course design is always a good topic. What I thought I might do is present the drawings and associated text and then update the script with current thinking (See “Time Capsule Review,” below.) Twelve years is a long time in a young sport like dog agility. The working title of the piece: The Border Collie Effect on Pipe Tunnels might have evoked obvious associations a dozen years ago, but stretches the imagination today. To be sure only a dozen years ago pipe tunnels often were not adequately bagged and bound. When a dog with tremendous inner combustion got in, the tunnel would get banged around pretty good. 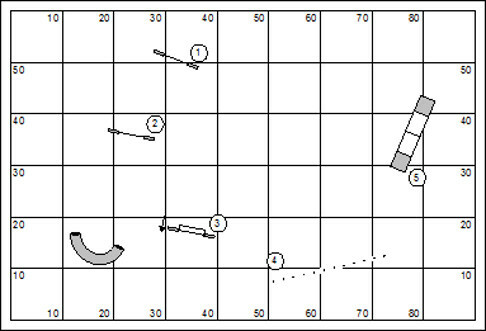 Often the pipe tunnel that you saw when you walked the course didn’t much resemble the pipe tunnel you came upon when you ran your dog as the tunnel likely had a new GPS address and was shaped differently. These days most pipe tunnels in competition are bagged by about a ton of dead weight, to the extent that they actually pose a hazard to the dog with too much energy and too much trust. 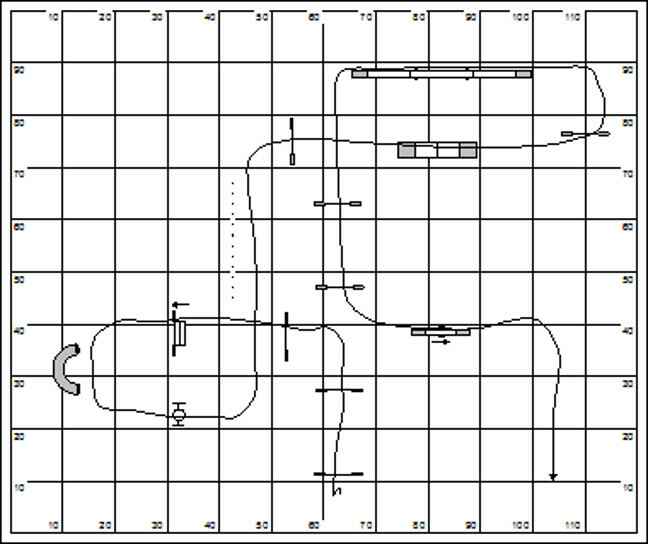 The most important obligation of the course designer is to create flow for the dog. In order to do so we must understand how dogs move. Without that essential understanding it is unlikely that the designer can create a course that is safe and fair. The dog nearly always moves in parallel with the handler. If the dog is ahead of the handler, he will curl back to the handler’s position. In the course segment shown here you see a long line from the end of the seesaw through jump #11. If the dog is at all faster than the handler, it is unlikely that the dog will reach jump #11 without an off-course penalty, or a refusal, unless the handler has a superb Go On (continue in a straight line) directional. Remember that the contact obstacles, and often the weave poles dictate the starting position of the handler. Most handlers will closely attend the dog’s performance of the teeter, to see that the dog hits the contact. Most significantly, that means that the handler has no advantage in real estate, forward of the dog. 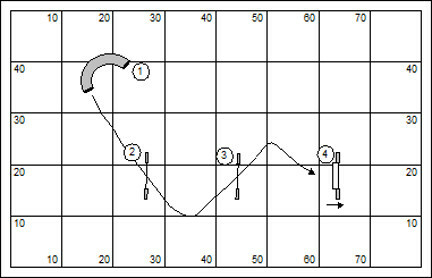 This is an error in course design. 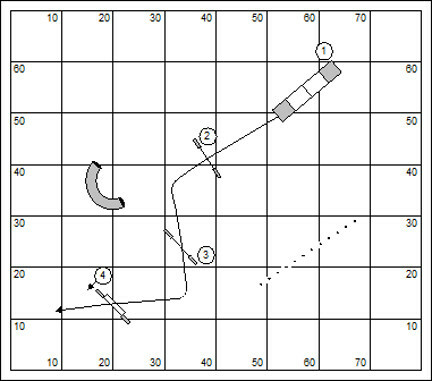 Most typically this error appears on Novice courses, as the designer does not understand the curling-back effect of the dog working ahead of his handler. 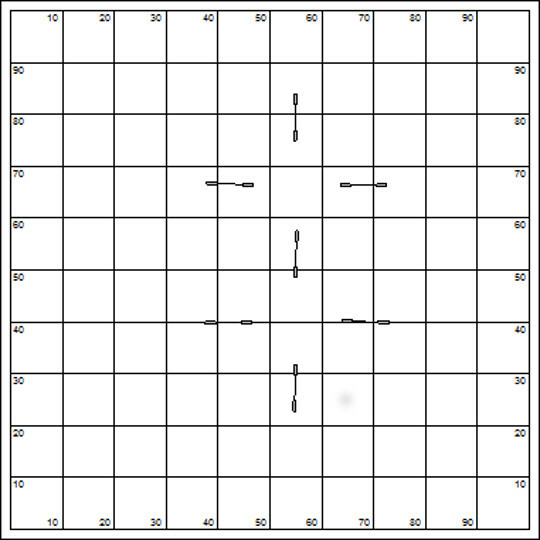 The designer thinks that he’s giving the Novice dog a nice straight line with no awful turns. When in fact some gentle turns would be a blessing for the dog and handler team. It would be easy enough to redesign this opening to accommodate the dog’s tendency to curl-back to the handler. This might mean readjusting the balance of the course. But there is no sense in including any long outruns in a course that doom most dogs in the field to failure. A better design would be to make the opening line curl naturally, for the benefit of the dog, as in this illustration. The dog’s flow will naturally follow the path the handler must take. Unfortunately, in fixing the dog’s line we’ve presented a rather difficult challenge for the Novice handler and his dog. Obstacles #8 through #10 require the dog to work on the handler’s right side. For obstacles #11 through #14, the dog should be on the handler’s left. So we’ve left the handler with a very technical turn. Coming off of a double spread-hurdle with the dog on the wrong side, the Novice handler is not likely to have the requisite skill to affect a cross behind the dog. 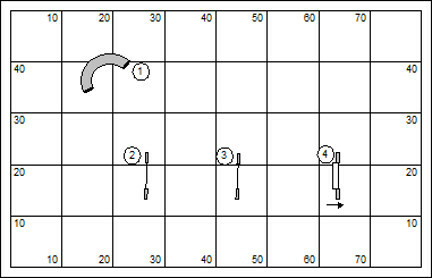 Most will try some kind of ugly Back Cross at the double, risking a bar down, or a refusal. This is too much of a challenge for the Novice dog and handler, but probably fine for Open/Advanced or Masters/Excellent dogs and handlers. For Novice teams the best way to soften a difficult corner requiring a change of sides is to use a pipe tunnel. In this illustration the pipe tunnel is presented so that the handler can do a Front Cross or a simple Post Turn to get the dog into the tunnel. The tunnel allows the handler to set up for the dog-on-left performance of the balance of the sequence. The double-bar hurdle is usually a required obstacle. So the course designer needs to find some other place to put it. 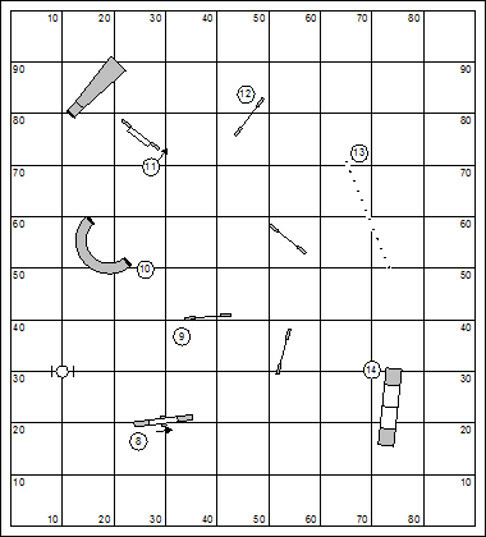 In this case the double was moved to follow tunnel, providing a nice straight approach and not grinding the dog into a hard turn after. Back to present time… I have several misdoubts about the initial writing. What really reaches out to grab me is how sympathetic I was to handlers without much skill or training foundation for their dogs. The proposition that a long straight line is killer remains true today. 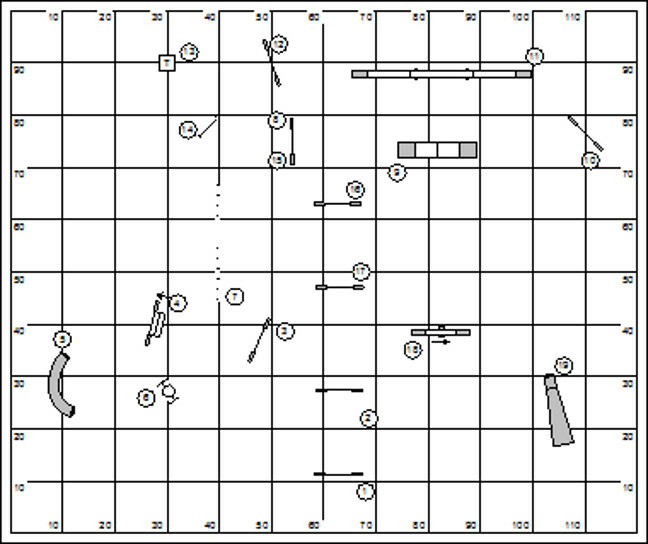 For the designing judge this might be a very core riddle to his course design. Does the handler understand the risk of being behind in the line? Also, in the initial illustration the sequence begins with the teeter. What I said then is true today. Many handlers will be glued against their dogs in the performance of the teeter or any other technical obstacle, putting them sorely at risk in the riddle to follow. Looking at the first drawing I can guarantee you that today I’d be positioned somewhere around the #10 jump while my dog is finishing up the teeter. At least this would be true in the ideal / “I trained my dog” world. More on course design tomorrow. You are currently browsing the Bud Houston's Blog blog archives for January, 2014.